UC Davis Graduate Student Composer Aida Shirazi will participate in IRCAM’s ManiFeste 2019 to have her new composition, Ardea Alba I, performed by the Orchestre Phiharmonique de Radio France in Paris. During the festival Shirazi will with work with internationally-renowned composer Kaija Saariaho and UC Berkeley Assistant Professor of Music Carmine Emanuele Cella. UC Davis music professors Henry Spiller and Anna Maria Busse Berger have received a major grant from the Henry Luce Foundation to look at source material collected by German missionaries in Indonesia during the late 19th and early 20th centuries. The materials will provide future scholars with rich original sources. April 3, 2019 Susan Lamb Cook Susan Lamb Cook, cello:|"Worlds Apart"
UC Davis Faculty Affiliate Susan Lamb Cook, cello, will be performing some of the Schubert selections on this Friday’s Faculty Recital, Worlds Apart, as well as on her Great Composers Chamber Music Series at the Harris Center at Folsom Lake College, on Sunday, April 7th. UC Davis music department composition alumnus Gabriel José Bolaños (PhD 2016) will join the music faculty at Arizona State University starting Fall of 2019. His recent music engages with theories of ecological listening: how our sense of hearing evolved primarily to interpret our environment. UC Davis Professor of Music Henry Spiller and graduate student Gillian Irwin spoke with interviewers from the Voice of America, Indonesia, about student life for Indonesian students studying at UC Davis, and about the music department’s Sundanese Gamelan Ensemble. From contemporary choral works to classics by Bartók and Mussorgsky, the UC Davis department of music will present three diversely programmed concerts within a week at the Mondavi Center. Bey’s union with Bourelly, who is a lecturer in the College of Letters and Science’s department of music, initially occurred around the former “no man’s land” area of Cold War Berlin in 1999; the two met there and agreed on a collaboration. In the piece, the performers move through a landscape filled with atmospheric sound bites, punctuated by waves of guitar motion and commentary on today’s tumultuous world. February 28, 2019 Kurt Rohde "Kurt Rohde's |Farewell Tour, PART 2"
Violist and composer Kurt Rohde says he’s planning to hang up his instrument in 2028, which might not seem especially imminent. But he’s determined to use that time to make things better for the violists who come after him. JP Jofre will be a featured soloist and composer in the UC Davis Symphony Orchestra’s performance of works by Argentinian composers on Saturday, Feb. 2. The concert begins at 7:30 p.m. at C.K. McClatchy High School Auditorium in Sacramento. 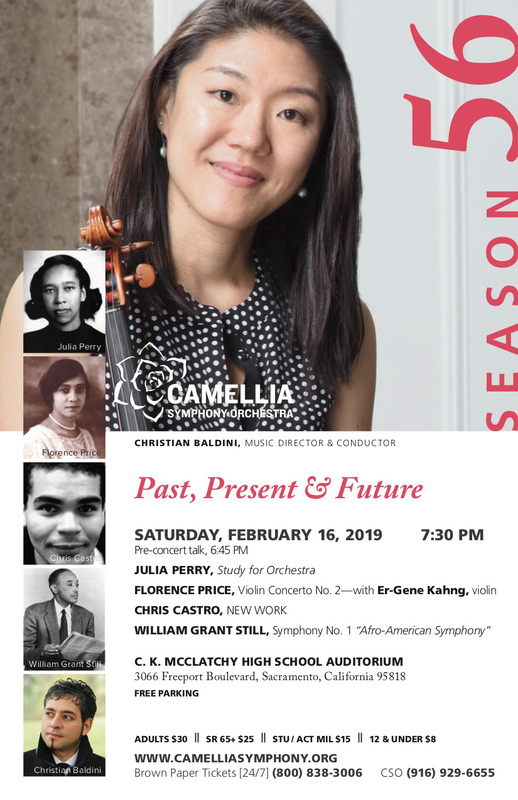 There is a pre-concert talk beginning at 6:45 p.m.
Flyer for "Past, Present, Future." Professor of Music Kurt Rohde of UC Davis, and Yu-Hui Chang—who taught composition at UC Davis in the early 2000s—are the two guest composers at this year’s Composers Conference. Winner of the 2017 Earplay Donald Aird Composition Competition (for his quartet Aeropittura), Daniel Godsil will be a guest composer at Western Illinois Univeristy’s New Music Festival 2019. The Festival takes place in Macomb, IL, March 3-5. UC Davis music graduate student composer Adam Strawbridge, along with Wyatt Cannon are winners of the SFCMP’s SF Search (call for scores) program. Both winners will have their pieces performed on the Player’s May 2019 concerts at SFJAZZ, which features the music of Julius Eastman and Bay Area composer, improviser, and pianist Myra Melford. The UC Davis College of Letters and Science’s Department of Music is holding auditions for University Chorus on Tuesday, Jan. 8, from 9 a.m. to 3 p.m. in the Music Building. Students, faculty, staff and community members are encouraged to audition. There are openings for all voice parts. Joining the chorus provides singers with the opportunity to perform onstage in Jackson Hall at the Robert and Margrit Mondavi Center for the Performing Arts. The hall’s superb acoustics are renowned by numerous acclaimed musicians and vocalists who have performed there. UC Davis alumnus Luciano Chessa (PhD 2004) recently conducted the Mannes Orchestra of the New School in a never-before-heard edition of a symphony written by a modern master composer Julius Eastman. Eastman died in 1990 in relative obscurity as he had spent his remaining years in intermittent periods of homelessness, with many of his belongings—including his scores—lost. New York Times: "A Long-Lost Symphonic Love Story Is Told Again"
The University Chorus under the direction of Caleb Lewis is currently in rehearsal for “Una Navidad Latina/A Latin Christmas,” featuring Spanish and Latin American Christmas music from the church and the village. Photographer Justin Han attended a recent rehearsal and captured the Chorus developing the concert’s program. All photos by Justin Han, copyright UC Davis. The Department of Music swings on certain evenings when the Jazz Bands of UC Davis rehearse for their upcoming Nov. 29 concert. Under the direction of Jacám Manricks, the Bands have been working on music by Aretha Franklin, Latin Jazz, Jazz Funk Fusion and a premiere a new suite by Manricks. Photographer Justin Han stopped by the Ann E. Pitzer Center for a rehearsal to capture the musicians working on the concert. All photos by Justin Han, copyright UC Regents. The Department of Music has become a hub for contemporary and new music. During its residency the music collective Ensemble Dal Niente performed the premiere of Erin Gee’s “Mouthpiece 32″ on Nov. 3. Photographer Justin Han stopped by the Ann E. Pitzer Center for a rehearsal the afternoon of the premiere to capture the musicians working on the new piece.